Now that I have decided to join in with the Voices on the Gulf project for this coming year, I realized that I needed to go back to some environmental projects from last year and pull some together on a website. These projects were done on Glogster and were part of the culminating work after reading the novel Flush by Carl Hiasson. The glog projects were built around an interest in an environmental issue, although most seemed to choose endangered animals as their topics. I want to have them on a website because I want to be able to show some examples as we move into doing writing and research around the Gulf oil spill and recovery efforts this year. I see Glogster as one platform for composition by my sixth graders. 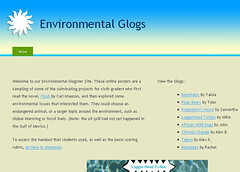 Visit the Environmental Glog site. If you want to learn more about using online poster sites like Glogster, I wrote an article over at Learn NC a few months ago called Digital Posters: Composing with an Online Canvas and created this glog, too. This entry was posted in my classroom and tagged glogster. Bookmark the permalink.